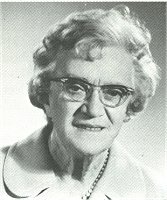 Anna Margaretha Hofmeyr, née Beyers, was born on 2 November, 1899 at Germiston. She studied at Stellenbosch University (Secondary Teacher's Diploma 1921) and at Amsterdam (Community Work). She was a lecturer at the College in Wellington before she moved to Stellenbosch. After many years service as a teacher, lecturer and librarian she was a full time writer for the last three decades of her life. I need more information and a better photo, please!